La Residence d’Angkor is a delightful boutique hotel decorated in tribute to the exotic Khmer architecture, and it is located on the banks of the Siem Reap River not more than a lob wedge from busy local markets and only minutes away from one of the Seven Wonders of the World, Angkor Wat. The rooms feature large bathrooms with free-form baths and showers and just about every amenity you could possibly want. 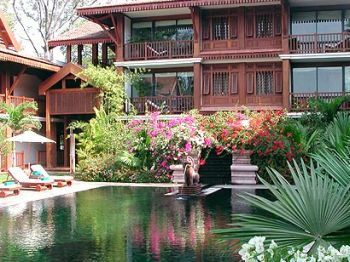 The property is encircled by majestic trees and the hotel is nestled intimately within a leafy walled garden.The rooms here are big, spotlessly clean, and comfortable, and the service quite cheery and bright. The best views are from the rooms near the swimming pool but all of the rooms are great. As comfortable as you will be and as much as you will enjoy relaxing in this hotel, it is an ideal place from which to stroll out among the lively local scene and explore Siem Reap. Guests from other hotels regularly find their way to his hotel for the fabulous dinner that is truly delicious, and to see the traditional Khmer dance show which is authentic. Coming home to this hotel after a busy day on the golf course and sightseeing is so welcoming with the lush gardens, tranquil grounds, and smiling staff, who seem to be very happy working there and take pride in seeing to it that guests enjoy the hotel as much as they enjoy working there. They greet you when you return with chilled face cloths and a sincere smile. In the evening when they turndown the beds they place a local Khmer sweet on the pillow as a gesture of appreciation for your business. The swimming pool here is quite large and the hotel is family friendly so children are welcome. 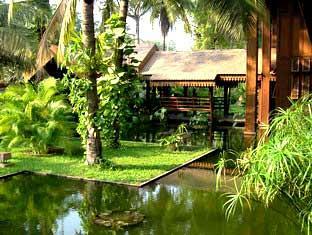 There is another smaller pool at the spa, which is where to go for an authentic Khmer massage that is at once relaxing and invigorating. 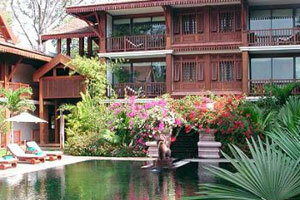 Contact one of our booking professionals now or add this hotel to a Cambodia golf package for you and your group. Submit this Cambodia Golf Package information form. Are you interested in a luxurious Thailand, Cambodia golf holiday, want to play golf in Thailand and or in Cambodia or just need some help planning your dream golf vacation? Would you always want to know more about golf in Thailand? This blog is meant for Thailand golf travelers or those planning a Thailand golf holiday or tour. If you're looking for world class golf lessons, golf training and golf instruction in Thailand, the Golfthink Performance Enhancement programs are the ideal way to achieve your golfing potential.